17 Jan 2019 --- UK advertising watchdog, the Advertising Standards Authority (ASA), has banned a poster for the energy drink Red Bull for reportedly implying that Red Bull has a beneficial impact on health, in particular, focus and concentration. Suggesting a product aids focus and concentration is a health claim, and therefore must comply with the claims authorized on the EU register. This is According to Regulation (EC) 1924/2006 on nutrition and health claims made on foods. Health claims are defined as those that state, suggest or imply a relationship between a food, or ingredient and health. The market has seen an increase in NPD featuring cognitive boosting ingredients, such as nootropics and adaptogens, and suppliers may be keen to transmit this increasingly popular claim. According to Innova Market Insights, there has been an average annual growth of 12.9 percent in the number of new F&B and supplement launches tracked with cognitive health claims between 2012 and 2017, and according to industry experts, this number is only set to grow. Red Bull responded to the complaint made by the Advertising Standards Agency (ASA) by saying that the advert promoted a consumer initiative: the 4pm finish, which encouraged workers to leave one hour early on Friday 14 September. Such initiatives imply the brand's humor and ethos, retorted the company, and do not directly or indirectly suggest that the consumption of the energy drink would help to achieve certain health goals. 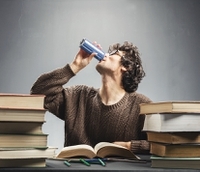 Red Bull further said that the text did not suggest its drink delivered a health benefit, made people better at doing their job through increased concentration or focus, or had any health benefit at all. It noted that the advert called for people to be efficient and complete their work faster to be able to leave early, which was not a health benefit. However, the ASA upheld the complaint. While the tone of the advert was light-hearted and part of a wider consumer initiative, the penultimate line of the poem, “to leap every hurdle a hectic day brings,” implied that Red Bull could help improve consumers’ mental focus, concentration and energy levels, therefore increasing productivity, the ASA notes. While the well-known motto of the brand, “Red Bull gives you wiiings” could also be said to be misleading, the ASA understands that the claim was trademarked before 1 January 2005, meaning that if construed as a health claim, it did not have to be accompanied by an authorized health claim as generally required by the Regulation. However, that exemption did not protect the use of other specific or implied health claims made about Red Bull in the advert. “For those reasons, we, therefore, considered that consumers would understand that the advert implied a relationship between a food and health, specifically that Red Bull could help increase mental focus, concentration and energy levels. Because those were not claims authorized on the EU Register we concluded that the ad breached the Code,” ASA says in a statement. Red Bull is of course not the first company to be cautioned for featuring potential unsubstantiated health claims in their advertisements. Last summer, a television advertisement for Heinz Beanz was banned by ASA after a complainant challenged whether the advert included a nutrition claim, regarding protein, which complied with the UK’s advertising codes. It was the second time the advert had been banned after it had been edited following a previous ASA decision. Last year, the UK’s Obesity Health Alliance (OHA) filed a complaint about an advert for Coco Pops Granola, from Kellogg’s, shown on children’s TV. While Coco Pops Granola is not a high fat, sugar and salt (HFSS) product and not subject to advertising restrictions, the ASA agreed that the advert had the effect of promoting an HFSS product due to use of branding which is highly associated with adverts for other Coco Pops products – some of which are HFSS. This was an important decision that set a precedent for protecting children from junk food marketing, said the OHA. However, following the ASA ruling, Kellogg’s demanded an independent review and, in November, ASA eventually decided to reverse its original decision.